The RedNet A16R widens Focusrite’s developing range of 1U Dante interfaces with network and power supply redundancy, delivering 16 channels of analogue input and output. The A16R provides premium 192kHz/24-bit A-D and D-A digital conversion with up to 119dB dynamic range, as well as two channels of AES/EBU digital I/O, to and from the Dante network. 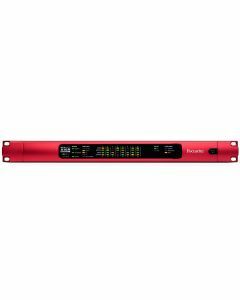 Focusrite’s RedNet A16R offers 24-bit conversion at 44.1, 48, 88.2, 96, 176.4 and 192kHz sample rates (remotely-selectable), as well as including pull-up/down capability. Electronically-balanced analogue audio I/O is afforded on DB25 connectors wired to AES59 specifications. Internal signals are equalised across the whole unit. Inputs and outputs are remotely configurable for 0dBFS= +18dBu or +24dBu signal levels. On top of this, two channels of AES/EBU I/O are provided on XLR connectors, with sample rate conversion on the input. The clock source for the unit can be external, or internal via Word Clock or DARS (via the XLR input). RedNet A16R also outputs Word Clock. The RedNet A16R utilises power and network redundancy, with two separate universal (100–240V) PSUs, which include IEC connectors with retaining clips, plus dual network interfaces on locking etherCON connectors. These ports can be configured remotely to Redundant or Switched (daisy-chain) mode.